The small coastal city of Puri is known all over the world as the seat of Lord Jagannath literally meaning the Lord of the Universe. Situated at a distance of 60 kms. From Bhubaneswar, Puri is considered to be one of the four most sacred places for the Hindus, because of the shrine of Lord Jagannath. The magnificent 192 ft. high, 12th century A.D. temple of Jagannath is one of the finest specimens of Orissan architecture. The temple and the deities enshrined are revered by millions of pilgrims coming to seek Lord’s blessings. Despite being closed for the non-Hindus, Jagannath continues to attract scholars of Oriental studies from all over the world. Besides the historic Jagannath Temple (Srimandir), the wide spread, beautiful, sandy sea beach sacred tanks like Narendra, decorated art of deities, traditional dance and music, cultural festivals, the hamlets of traditional artists and variety of handicrafts are few veritable feasts to the eyes of tourists. The hamlets like Chitrakar Sahi, Pathuria Sahi, Kundheibenta Sahi are the home of numerous artisans and craftsmen who produce rare and exquisite handicrafts of large variety. The main temple, a majestic structure of 65 metres high, stands on an elevated platform in the heart of the city – its swirling pinnacle commanding the landscape for the miles around. It is a monument of the 12th century A.D. with all the richness and plasticity of the Kalinga style of architecture. Apart from the main temple one can see within its precincts a host of other smaller temples including Goddess Vimala, Laxmi and Vishnu and Ananda Bazar, a unique restaurant of the world. The other notable shrines like Gundicha, Lokanath, Sonar Gourange, Siddha Bakul, Gambhira Math, Chakratirtha and tanks like Narendra, Swetaganga, Markandeya, Indradyumna, etc are worth visiting. The festival of chariots known as the Ratha Yatra, an annual ritual spreading over the entire summer and monsoon months, makes Puri attractive and enjoyable for the tourists. The Hindu new year beginning in Mid April heralds the summer and is the season for the famous Chandan yatra at Puri. The Chalanti Pratimas or moving images of the deities take a ritual boat ride after a refreshing bath in fragrant sandal wood scented water. This is followed by Snana Yatra, literally the festival of bath, in which the main images are installed on the bathing platform and given a ceremonial bath. The Lords then convalesce inside the sanctum sanctorum, closed to public view. During theis period the devotees have to be satisfied with a darshan of images of the Lords on cloth paintings or Pattachitra especially made for the purpose. Then comes the annual journey of the three deities, on grand chariots to their garden house – ‘GUNDICHA’. On the way their aunt feeds them with Podapitha (specially baked rice cakes). The deities on reaching Shri Gundicha give darshan to countless devotees everyday and after a lapse of 8 days, return to the main temple riding their chariots. Apart from this, tourist festivals like Shreekshetra Ustav & Beach Festival are also great attraction for the tourists. Puri offers a rare opportunity to the tourists to witness the colourful sunrise and sunset on the same beach where they can bathe and laze for hours on the golden sands. One can also see and enjoy traditional fishermen in hundreds, plying their catamarans or sail boats and drawing into their nets a rich catch of prawn, pomfrets and other fishes on this long and wide beach extending for miles. The roadside hotels and stalls offer the best sea food delicacies to the tourists. The grand road, as it is called, is ideal for a leisurely stroll and shopping for souvenirs and mementoes. Typical Puri handicrafts include miniature stone sculptures, woodcarvings, seashell items, patta paintings on cloth canvas and colorful appliqué work. One can also pick up these pieces from Art and Craft Museum, Sun Crafts, Utkalika and other many of the shop’s located in around Sargadwar, literally, the Gateway to Heaven. 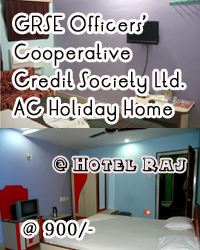 GRSE OFFICERS’ CO-OPERATIVE CREDIT SOCIETY LIMITED has started their AC Holiday Home at Raj Hotel, Puri with 2 Nos. 3 beded sea facing AC Deluxe room in 2nd floor with attached balcony, LCD TV, Intercom facility. The Holiday Home facility includes lift facility, in-house restaurant with attractive discount on food value, own tours & travels facilities apart from general hospitality. Booking charges of Rs.30/- per booking extra. Neora Valley Resort is one of the best and comfortable stay in Rishop. All rooms with a view of Kanchenjunga and several other peaks.Wooden furnished Cottages and five beautiful duplex rooms with attached bath, geyser, CTV and in house restaurant , wide lawn with garden. The deep silent forest of Pine, Birch, Fir and Orchids with soothing path following the chirps of birds & the view of blue sky. Kanchan View Tourist Lodge is located in the Top most Ridge of Rishop with 180 degree full view of snow capped mountain peaks from Nathula to Kumbhakarna including Kanchanjungha from it’s wide lawn and balconies of every room. Wooden furnished double bed rooms and triple bed cottage with balconies, travel desk, & in house restaurant & garden. Sunakhari Retreat, Green Valley Resort and Rishyap Tourist Centre , are situated at the topmost position at Rishop in a natural atmosphere and with Kanchenjungha view. All rooms are wooden furnished with attached western toilet, floor carpet, CTV, Garden, Lawn Restaurant, Hot Water Supply. Special Attraction: 180° view of Mt. Kanchenjungha & Himalayn Range from Resort. 10% service charge on total bill amount. Wooden furnished triple bed rooms, a few with balconies, travel desk, & in house restaurant . Suntec Resort is a budget hotel with excellent surroundings all over in Rishop. Wooden furnished 4 no.s triple bed rooms, a few with balconies, travel desk, & in house restaurant . Hotel Sonar Bangla is situated on the parallel hill top of Hotel Kanchanview at Rishop. With a excellent openings in the front with magnificent Kanchanjhengha standing tall, Sonal Bangla offers great view of the mountains and valley with its 6 rooms.